The bookplate is interesting because it features illustrations of a camera, a microscope and a bicycle -- perhaps signifying well-rounded interests in science, the arts and the outdoors. 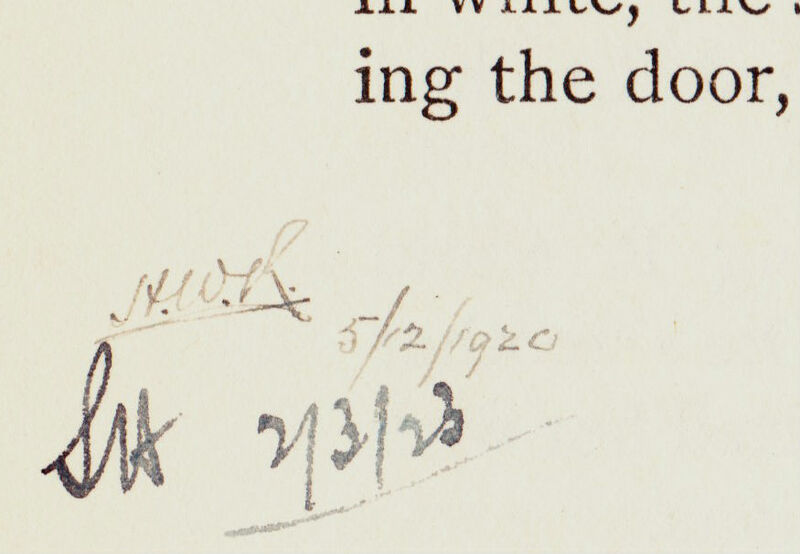 On the final page of the novel, two people have signed their initials and the date, presumably to indicate when they completed reading it. The initials are "H.W.R. 5/12/1920" and "S.H. 2/3/23". I found some genealogical evidence of a Herbert W. Rhodes who was born in New Jersey in 1874 and worked as an insurance clerk. There was a Herbert W. Rhodes of Norwood, Massachusetts, who, fittingly, manufactured postcards in the first decade of the 20th century. And there was famed Portland, Maine, architect Herbert W. Rhodes, who designed the State Theatre and Eastland Park Hotel in Portland in the 1920s. 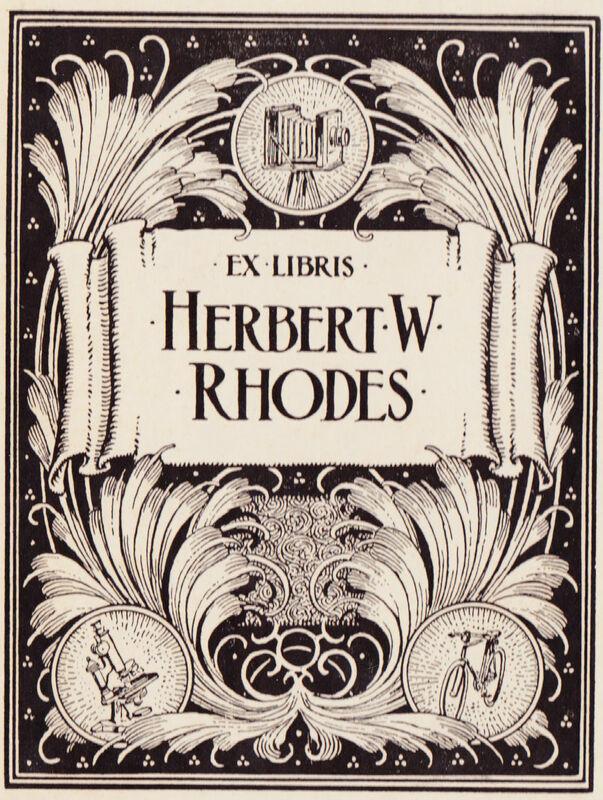 I suppose any of those three Rhodes could have owned a copy of Major's 1903 novel. Some other notes about "A Forest Hearth." 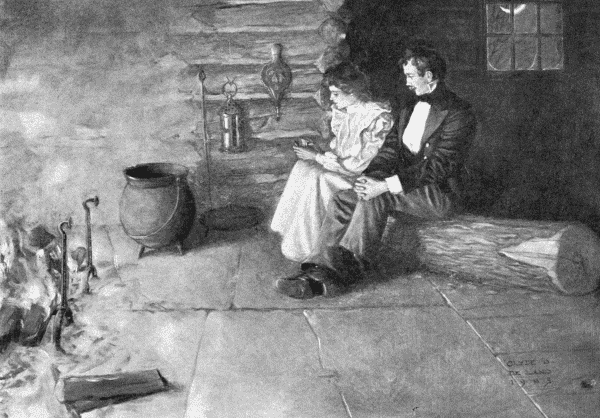 It featured illustrations by Clyde O. DeLand (one of which is pictured at right). The full text is available here from Project Gutenberg. A strenuous sense of justice is the most disturbing of all virtues, and those persons in whom it predominates are usually as disagreeable as they are good. Any one who assumes the high plane of "justice to all, and confusion to sinners," may easily gain a reputation for goodness simply by doing nothing bad. Look wise and heavenward, frown severely but regretfully upon others' faults, and the world will whisper, "Ah, how good he is!" And you will be good—as the sinless, prickly pear. If the virtues of omission constitute saintship, and from a study of the calendar one might so conclude, seek your corona by the way of justice. For myself, I would rather be a layman with a few active virtues and a small sin or two, than a sternly just saint without a fault. Breed virtue in others by giving them something to forgive. Conceive, if you can, the unutterable horror of life in this world without a few blessed human faults. He who sins not at all, cannot easily find reason to forgive; and to forgive those who trespass against us, is one of the sweetest benedictions of life. I have known many persons who built their moral structure upon the single rock of justice; but they all bred wretchedness among those who loved them, and made life harder because they did not die young. At the back of the book, there are 18 full pages of advertisements for other books, including MacMillan & Co's "new six-shilling novels." Among those are "The Crossing" by American novelist Winston Churchill, who is sometimes confused with the British statesman. 2. Majors' 1898 debut novel "When Knighthood Was in Flower," published under the pseudonym Edwin Caskoden, helped to spur a pop-culture interest in historical-romance novels and films. 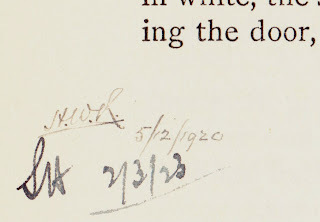 Might the bookplate have been pasted into the book a few decades later than it was published? The bike and microscope look to be later than 1903. I wonder how many people have previously owned that book?! 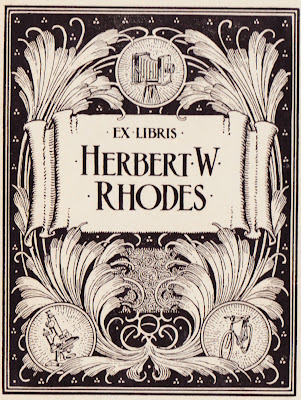 The bookplate belongs to Herbert Rhodes of Ilkely, Yorkshire, UK. He was a potholer, photographer and lantern slide lecturer as well as being a Fellow of the Royal Microscopical Society!